This current generation of pop-punk – bands like Neck Deep, The Story So Far, The Wonder Years et al – have taken the genre further than its ever been taken before, but there are some from the newer crop that could definitely have a similar effect. Enter State Champs, a band who have been on the fringes for a while, and with upcoming album Around The World And Back, their journey to the top could be a very real prospect indeed. It’s this tour that acts as a prelude to their explosion, rounding off the campaign for their near flawless debut The Finer Things and preparing them for superstardom. Openers ROAM  might be a way off joining them yet, but if Neck Deep have taught us anything it’s that Brits can be pretty good at this pop-punk palaver, and these Eastbourne lads are some of the best of the new breed we’ve got. There’s nothing revelatory about their bushy-tailed pop-punk, but songs like Warning Sign and new song Cabin Fever hint at far bigger things to come. Knuckle Puck  are the name on most of the pop-punk elite’s lips, and it’s easy to see why. They’re very like The Wonder Years without the foreboding pathos – eloquent, intelligent and, crucially, bordering on inventive. True, they fall into some of the genre’s pitfalls at times, but the likes of No Good and True Contrite suggest that, with a bit of time to polish up, they could be in the running for massive success. Oh, and for anyone who says that pop-punk is severely dumbed down, Joe Taylor’s lyrics are some of the most fascinating in the game. Knuckle Puck: smarter than the average band. Considering they’ve spent a good part of the last few months playing arenas with 5 Seconds Of Summer, the return to sweatbox venues like this could be misconstrued as a step down for State Champs . That couldn’t be further from the truth – they’re a punk band at heart, and it’s in venues like this where their songs shine the brightest. Coming out of the traps swinging with new single All You Are Is History, the pace never dips, and it’s just under an hour of near-perfect pop-punk. Largely drawing from their debut is a smart move – the likes of Remedy and Simple Existence are already treated like genre classics, with a constant stream of crowd surfers crashing over the barrier at each possible moment. The other impressive thing is how fantastically new songs fit into the flow of the set. All You Are Is History and Secrets are built around roughly the same skeleton as their debut and as a result manage to slot into the set seamlessly, but the more understated Losing Myself‘s pushing on something a bit different leads to a bit of a bump when it’s aired late on. It’s still a great song and that’s only a minor problem – on this showing, State Champs are one of the most consistent bands in the game with plenty of songs to back it up. Nothing’s Wrong and Deadly Conversation have the insatiable bounce of the heavyweights, and closer Elevated just shows exactly the sort of thing this band can achieve with their mounds of potential. 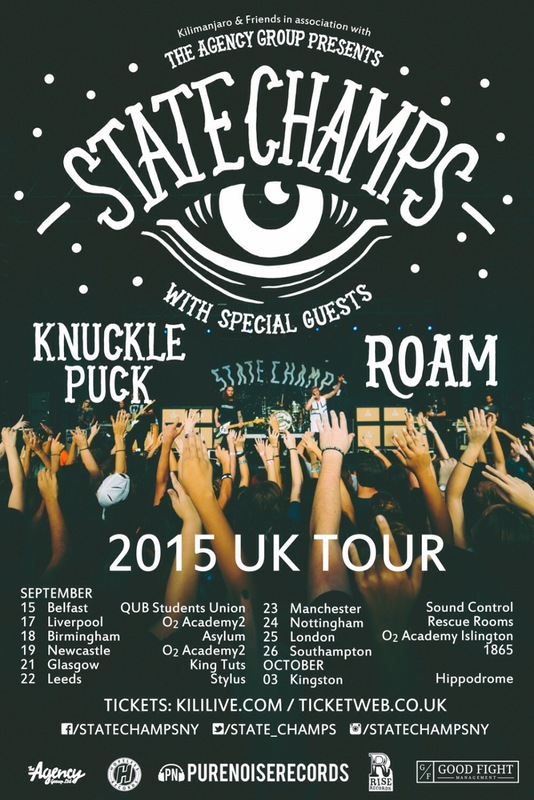 It may only be early days of this tour yet, but if State Champs continue on this form throughout, that top tier will be having to welcome a new member sooner rather than later.